The Hammers fans teased their Chelsea counterparts about the future of the Belgian, who continues to be linked with a move to La Liga. Eden Hazard insists he is only focusing on Chelsea after dismissing chants from West Ham fans saying he was on his way to Real Madrid. Hammers supporters claimed the Belgian’s move to the Santiago Bernabeu was virtually a done deal during their side’s match with the Blues at Stamford Bridge on Monday. Hazard has continually been linked with a move to the Spanish giants this summer with his Chelsea contract due to expire in 2020. Those rumours were fuelled still further by comments last week from Real Madrid coach Zinedine Zidane, who revealed he was a long-term admirer of the Belgium winger. Hazard revealed in February that he had made a decision on his future but stopped short of revealing whether he will be at Stamford Bridge next season or moving elsewhere. When asked about the chants from the West Ham fans, Hazard told Sky Sports: "They are wrong. For now I am just focusing on Chelsea until the end of the season. I want to finish top four and [win the] Europa League, we still have a lot to do and then we will see." 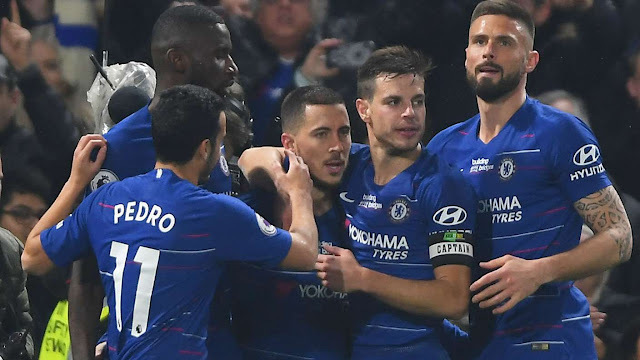 On the pitch, Hazard delivered a man-of-the-match performance with his two goals securing victory that lifted Chelsea up to third in the Premier League for the first time since December. "We are in good momentum,” said Hazard. “We have won three in a row. For the mentality, it is good to keep going. Top four and the Europa League is our target so we need to do well in both but we can do it." "I think we played well. The game was not easy because West Ham are a great team. They created a few problems for us. But we did everything. We created a lot and scored two great goals." Hazard’s opening goal was particularly memorable, the forward waltzing past five West Ham defenders before calmly finishing beyond Lukasz Fabianski. "It was something special," added the Belgian. "I took the ball and then I tried to move forward. In the box it was hard for the defender to challenge me because if he touches me it could be a penalty.